Sorry for that super cheesy title, it had to be done. This Rainbow Clutch (a pattern from my book) was so fun to make using scraps from Rain Walk fabrics. I love how little this clutch uses in terms of fabric, but I love it’s impact. I’ve seen so many beautiful ones tagged on Instagram (#HandmadeStyleBook) and it’s always thrilling to see what beautiful fabric combinations you come up with. It definitely makes me want to make more! And to use those tiny precious scraps I’ve been hoarding. I think it looks so pretty with the awesome fall colors we’re having this fall! I’ve been making it a point to enjoy every last bit of it until winter comes. It’s not often that we have this many weeks of incredible weather. I’ve been mountain biking with my husband on his days off and it’s just been fun to reconnect and be outdoors. The girls and I have been walking home from school as much as we can and enjoy stomping through the leaves. I’m really happy I’ve been able to soak up this time with them. Life’s too short! All that to say, is that this clutch makes me happy every time I see someone make one. They make me smile. Thanks so much for sharing everyone! 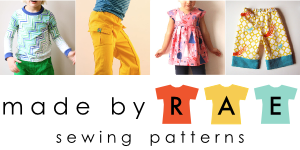 Find Rain Walk as these awesome shops!